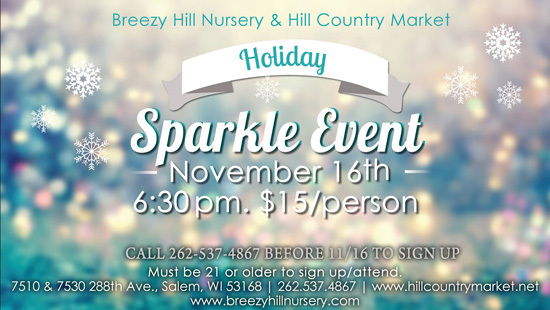 Enjoy holiday decor and a designer mantle decor demo at Breezy Hill Garden Center from 6:30pm – 7:15pm and then head across the parking lot to Hill Country Market for a wine tasting with appetizers and a silent auction to benefit the Sharing Center of SE Wisconsin. Find everything you need for entertaining this holiday season! $15/person. Also, Kids Yoga at Wild Roost Salon and Turning Leaf Acupuncture from 6:00 – 7:30 $10/per child. Please, call and pre-register for this event. Call 262-537-4867 and sign up before 11/16/2018. Must be 21 or older to sign up/attend.